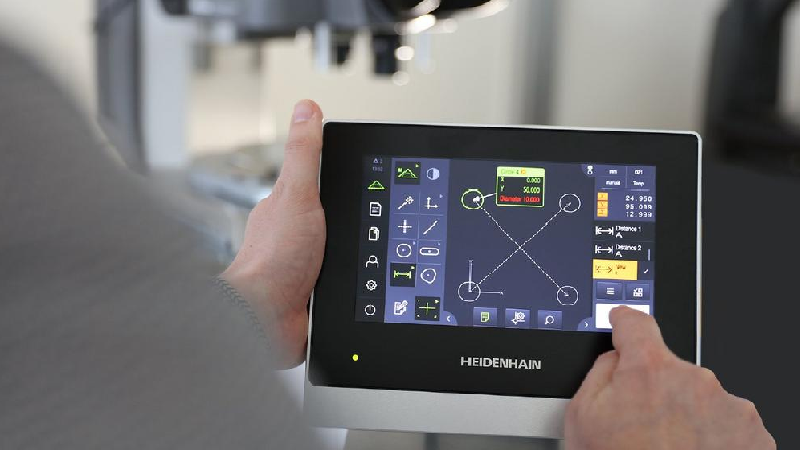 Heidenhain Corporation has introduced its new QUADRA-CHEK 2000 evaluation electronics as part of the new generation of metrology units designed for shop floor conditions. This new package of metrology software and hardware is equipped to meet measurement needs on optical comparators, measuring microscopes, and other 2D metrology equipment that may require geometric functions. The QUADRA-CHEK 2000 is the direct successor to the immensely popular ND 1200 (QC200) model and is the perfect example of how modern electronics can support and simplify manual processes. With the QUADRA-CHEK 2000, the user simply acquires measuring points on flat 2-D contours either manually using crosshairs or automatically via optical edge detection (OED) on the machine. In either mode, the QUADRA-CHEK 2000 then provides various predefined geometry tools for recording two-dimensional contour features. The standard “Measure Magic” function makes this measurement especially easy and results are then relayed on its high-resolution 7-inch color touchscreen. The QUADRA-CHEK 2000 also offers an integrated measurement report function that makes it easy to create a report directly upon completion. These measurement reports contain the measurement and tolerance results as well as additional information. With the help of the software, users can create individual measurement report templates and import them via the unit’s file management. Reports can be saved in various formats including PDF or CSV files, as well as printed from a connected printer if desired. Due to its industrial design, the QUADRA-CHEK 2000 is ideal for applications in both the inspection room and in harsh production environments.